Oct. 16, 2015, 12:22 p.m.
Patrick LaForge, who’s leading the team, says the Times hopes the new unit adds value to readers and encourages them to subscribe. By Joseph Lichterman @ylichterman Oct. 16, 2015, 12:22 p.m. 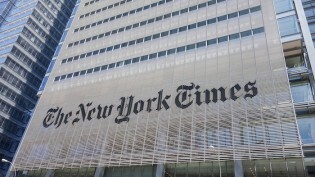 The New York Times last week outlined its ambitious plans for its future in an 11-page memo that detailed how the paper thinks it can double its digital revenue by 2020. To do that, New York Times CEO Mark Thompson told Ken Doctor they will need to develop strategies and products that will entice readers to spend more time with the Times and keep them coming back to Times platforms. “I think what’s happened over the last 12 months is a growing understanding — from data science and machine learning — that time spent is one important measure, and that frequency is a very important attribute and very significant predictor of subscription and retention,” Thompson said. Patrick LaForge, the Times’ editor of news presentation, is leading up the effort and told me the group’s focus isn’t to chase cheap traffic, but rather to provide value for Times subscribers, helping them cut through the mess that is social media. I have a new job at The Times. I'll be setting up our Express Team, a live news and breaking news desk serving all online sections. The Times has been experimenting with this new structure since July, covering stories such as Sandra Bland’s death, the community college shooting in Oregon, and the controversy surrounding the Muslim student in Texas who was arrested after he brought a clock to school. It already has a staff of eight or so globally who handle rewrite duties around the clock, LaForge said, adding that the teams that run the NYT Now app and the Watching widget on the homepage also contribute. The paper plans to add a handful of staffers to the new Express Team, but LaForge said they’re still figuring out exactly how the group will be staffed. Here’s an edited transcript of my conversation with LaForge; we discuss how the Express Team will utilize those new formats, interact with the Times’ existing desks, and cover news around-the-clock. Joseph Lichterman: I think the focus on stories that are bubbling up online is really fascinating. So how are you determining what those stories are? Are there specific tools that you’re using or ways to measure conversation to determine what might be a story worth covering? Patrick LaForge: Obviously, there on the search side, you can look at Google Trends to see what stories are starting to trend. We also use CrowdTangle, which is pretty good for showing what’s picking up velocity on Facebook and some to some degree on Twitter. Some of it’s looking at curated lists that we’ve developed of people on social media, all the different platforms. But I think we’re going to be doing a lot more evaluating of tools for that or maybe even developing some of our own. I’ve been on Twitter for years [Note: LaForge is patient zero for the phrase “RTs are not endorsements”], and tools can only take you so far. Some of it is just gut instinct about what is a good story. You need to also recognize a good story and know how to cover that story. We don’t need to cover every social media hashtag or the thing that’s making people angry on Twitter at this moment. We can be a little more selective and choose the stories that are actually relevant and interesting to our audience. I know some sites are interested in driving traffic, and so they are drawn to whatever is popular at the moment. We have a somewhat different approach. We are lucky to have subscribers who are interested in a certain type of coverage, and we want to attract more subscribers. So we’re going to cover the kinds of stories we think will turn people into subscribers and cover them in a way that is serious and substantive, which I think is what people expect from the Times. Lichterman: Earlier this month, the Times announced that it planned to double digital revenue by 2020. I know a lot of that focus was on providing more value to subscribers, and it seems like that type of initiative fits into that. LaForge: Our readers are busy people. They are also on Twitter and Facebook and when they see something passing in their stream, some conversation about something that’s fascinating the online communities out there, they just want to know quickly: What is this about? Do I need to care about this? Is it important? And why should I care? Sometimes it’s not that important, and they don’t need to care about it, and we probably won’t cover it. An adorable puppy dog story — I don’t think we’ll be doing that kind of thing, but if something is truly newsworthy [we’ll cover it.] I use that term quite broadly: It doesn’t need to be the most urgent news. It can be light — it can be captivating in any number of ways. It doesn’t need to be something that you would expect to see on the front page of the Times; we cover a wide variety of things, whether it’s style, celebrities, or fashion. Here’s an example: So the Travel section comes out once a week. It’s done well in advance. But the travel editor has said to me: Every once and awhile we see a story that pops up on social media that day that’s travel related. It doesn’t necessarily interest the international desk, the national desk, or some other desk, but they think it’s an important travel story and they would like a way to cover it live. They don’t have somebody who’s covering live daily news easily for them, so they could turn to our desk and we could help them with that. The national desk has a limited number of correspondents spread across the country. It takes a while to get them in place, they don’t always know when a certain news event is going to blow up into something big. We have helped them in a number of stories to plant the flag and get something out there while they get people into place. On the metro desk, the traditional use of rewrite has been when you hear there’s a fire or a shooting, and you don’t know how big or important it is, so you’ll make some calls on it. It’s an extra set of resources for that, or you’re seeing something online for some comment or meme that is drawing a lot of attention and might be of interest to Times readers. Lichterman: The announcement also mentioned different formats, like short videos or lists. How are you thinking about those formats, and how are we going to see those implemented? LaForge: I need to emphasize in all of this that we’re in very early days, so to suggest that I’ve thought out all of this stuff would be incorrect. I’m still half in my other job, as I’m trying to leave the copy desks, my previous department, in good shape. But yeah, we want to do more with video, we want to do more with interactives, we want to do more with non-text stories. A picture, or a slideshow, or other forms of storytelling that haven’t even been dreamed of yet are certainly things we want to do. They’ve done some things already when if there’s a big breaking story. They’ve done “everything we know about this story,” “what we know and what we don’t know” — that kind of thing. They’ve done Q&As with principal players in a particular story. We haven’t had too many opportunities for the desk to help on a really big story — maybe the Oregon shooting, they did do a liveblog for that — but if there’s a really big story that breaks on a particular desk we want to be able to help with some of those additional things that readers really like, like putting it in context, having a Q&A, or having some kind of visual sidebar of some sort with big breaking news stories. We have all these tools in the newsroom, but we haven’t deployed them as much as we could. We believe there’s a big opportunity in video news for us, and we haven’t really even tapped that as much as we should. Lichterman: Where will the stories you’re producing live? Will there be a special section or will it just go to the existing sections? What will the output look like? LaForge: I don’t think there’s a need for a special section of breaking news. Really, we’re a supplement to the desks. If it’s a national story, it’ll go in national. If it’s a science story, it’ll go in science. If it’s a sports story, it’ll go in sports. Readers want things organized by topic. We already have the ability for stories to live in several different types of buckets, but really, if you’re looking for the story about what happened in Oregon, you’re going to go to the U.S. coverage area. You’re either going to go geographically or by whatever the particular subject is, whether that’s health, or science, or sports. In a sense, it’ll be invisible, and really a support role for the people who do have the subject expertise. If we could put a beat reporter who’s a specialist on a topic on every story that breaks on that beat, great, but as a practical matter, that would require people who are awake all the time, are never on vacation, and able to travel at the speed of light. That’s the traditional role of rewrite. It’s a way to leverage your staffing to always be available to cover the news. Lichterman: It seems like this also will build on the work of NYT Now and Watching. Something I’ve noticed with Watching is that it’s really aimed toward a daytime weekday schedule. Is this team going to be more 24/7? LaForge: Well, there’s where we are now, and where we might end up. I don’t know where we’ll end up, but now we have someone in New York around 6 in the morning who’s starting to look at what’s happening as dawn breaks on the East Coast. We have people through the morning, and then we have a couple of people starting at night in the traditional rewrite position, really until early morning. Then they hand off to our newsroom in Hong Kong, and people there have written what I would describe as rewrite stories. They work for the International New York Times, but we’re all sort of working together and we’re in constant communication. There are editors in the overnight in Asia and then in London who are watching the news when those time zones are awake and active. There are writers available to us in both Europe and Asia who can write these sorts of stories. An editor who just went over to London is Sewell Chan, who I worked with on the City Room blog years ago on metro, and he is keeping us quite current before our morning person comes in here. It is in a sense a global operation. My current focus is going to be on the morning here in New York. That’s when we have a big audience. Really from about 6 until noon as the sun heads west, people are waking up. We are looking to make sure we are on top of international developments overnight as well. 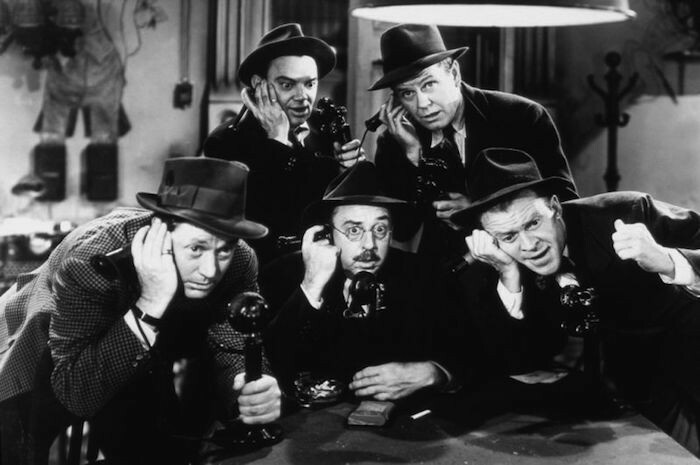 Photo from His Girl Friday is in the public domain. POSTED Oct. 16, 2015, 12:22 p.m.
Lichterman, Joseph. "Get me rewrite: How The New York Times is building out the Express Team, its new breaking news desk." Nieman Journalism Lab. Nieman Foundation for Journalism at Harvard, 16 Oct. 2015. Web. 25 Apr. 2019. Lichterman, Joseph. 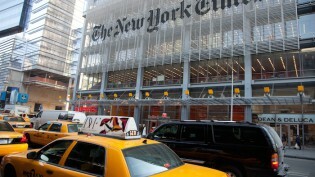 "Get me rewrite: How The New York Times is building out the Express Team, its new breaking news desk." Nieman Journalism Lab. Last modified October 16, 2015. Accessed April 25, 2019. https://www.niemanlab.org/2015/10/get-me-rewrite-how-the-new-york-times-is-building-out-the-express-team-its-new-breaking-news-desk/.